The soccer (football to the civilized world) videogame FIFA 10 has broken records as the fastest selling sports game in the world. Electronic Arts said today that FIFA 10 has sold over 4.5 million copies worldwide since it was released in Europe on October 1st. EA also claimed that the soccer title was the fastest-selling sports videogame in the world with 1.7 million units sold in Europe in one week. It is currently the best selling game overall in Europe in 2009. The record numbers keep coming, EA reported that there are on average over 3 million games played each day on Xbox Live and the PlayStation Network. Between October 1st and November 30th, there have been a total 113 million total online games played over both networks. Those are some pretty impressive numbers for a game that doesn't have "Duty" or "War" in the title. The game is so popular that EA announced today that it will be releasing a downloadable expansion of sorts called FIFA 10 Ultimate Team, which broadens the ability to manage and play with your fantasy soccer team. With the expansion, you will be able to craft your team from over 7,000 players spanning 27 leagues. Developed by EA Canada in Vancouver, B.C. 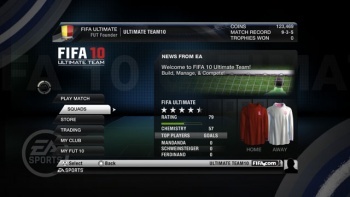 FIFA 10 Ultimate Team will retail for $4.99 in February, 2010. The world loves its football, and having played a fair number of FIFA matches in my day, I have to say that the franchise is built on solid gameplay. If FIFA is doing so well around the world, one only wonders what kind of record numbers it would break if it were to really catch on for U.S. gamers. Will FIFA 11 break MW2's numbers?